Those of you who follow my social media channels may recall that I spent 2 days chaperoning my son’s 6th grade field trip to Toronto. My duties entailed riding a humongous motor coach for approximately 12 hours and escorting my group of four kids through one fort, one legislative assembly, one museum, one gigantic tower, another museum/old house place, a boat tour of Niagara Falls, and souvenir shopping. Ask the driver to increase the volume on the movies playing on the overhead DVD player, especially if it’s earlier than 6 am and if the movie includes loud explosives. Kick the chaperone’s chair repeatedly from behind. Sing the theme song from a favorite childhood TV show over and over. Most chaperones really enjoy hearing “We just got a letter” from Blue’s Clues, especially if it’s earlier than 6 am. If your chaperone is about to nod off, make sure you rouse her to ask for a tissue or piece of gum. Everyone in the group should take turns doing this whenever the mood strikes rather than asking all at once. Wander off when your chaperone repeatedly says, “Stay with the group.” Make those chaperones work! Talk or take pictures when the docent or tour guide explicitly says not to talk or take pictures. Realize you need to use the bathroom 5-10 minutes after the group just had a bathroom break. Have a giant pillow fight in your room and leave all the pillows and sheets in a ball in the corner. Ignore the second wake-up call. Sleep as much as you want until the chaperone has to pound on the door repeatedly and wonder, nervously, if you are all alive. Finally, enjoy some souvenir shopping under the guidance of your chaperone. When your chaperone asks, “Do you think you should spend $30 on candy?”, just look at her incredulously. The answer is YES. Make sure you forget your $30 bag of candy at the fourth candy store that your group visits. Realize that you lost your $30 bag of candy at the eighth candy store you visit. Make your chaperone retrace your steps with you to locate your lost $30 bag of candy. Ask you chaperone to carry your $30 bag of candy the rest of the trip. There you have it! 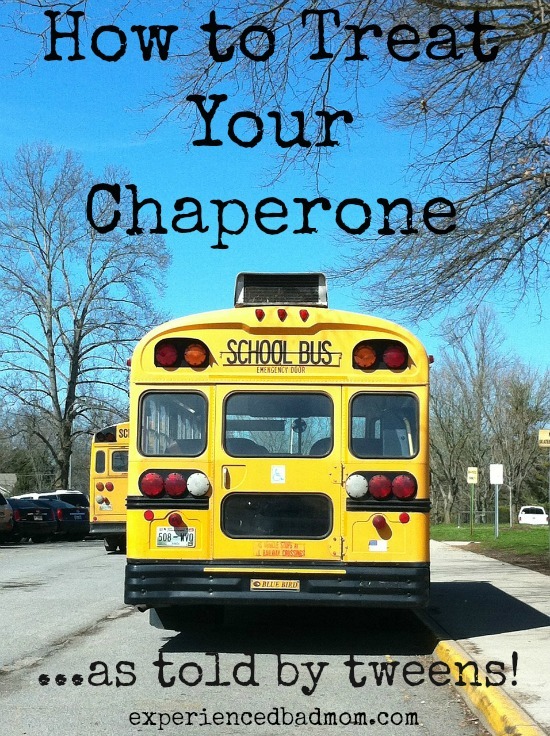 I hope you enjoyed these great tips on how to treat a chaperone as much as I did. If you have a tip for how to treat a chaperone, or a story of a chaperoning adventure gone wrong, then add it below in the comments. I’d love to read it! I’m glad YOU made it back alive, and it’s impressive that you brought back all the kids safe and sound too! There should be some sort of award for that! Not only was there NOT an award, but I even had to pay for my trip! My 8yo is already telling me I’ll need to chaperone her when she’s in 6th grade. I’ve got 4 years to prepare. Yes, these tips are so helpful! Our school goes to Washington DC in 8th grade – that’s at least 8 hours away by car, or 15 hours by huge bus that goes 45 mph. I’m already thinking my son will do just GREAT without me! Welcome to Canada! I am so sorry I was unable to greet you the second you crossed the border. Guess what? I’ve never, ever been to Niagara Falls. I am so jealous. This past February a family funeral was held a mere 30 minutes away. My brother managed to hop over for a visit at the Falls but my timing wouldn’t allow it. Dang. As for a chaperone story – well that water polo one to Federal Way, Washington was rather special. One lad stopped traffic by doing a somersault half way across the road and the big boys woke up the younger ones by visiting their room and stealing their pants. Uh huh. 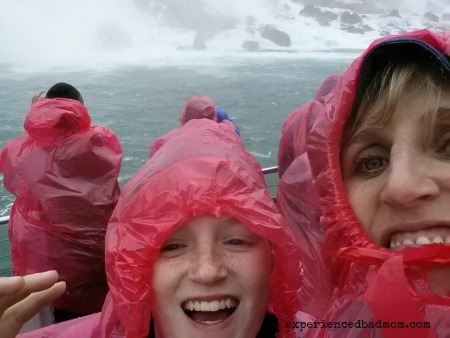 I’m not sure you can call yourself a Canadian if you haven’t been to Niagara Falls?! Hello, eh! Federal Way sounds like it was good times. Good times. Yeah. You’re a saint among women. Also, had you encouraged my 11 year old self to buy $30 worth of candy, I would have petitioned to have you canonized on the spot. Yikes! You are a saint, indeed!! The only time I ever chaperoned an overnight trip was with my daughter’s high school debate team when they went to Nationals. Fortunately, they were a bunch of dorky nerds (I say that with utmost admiration and respect) who were more interested in arguing foreign policy than having pillow fights. I was jealously eying up the girls’ groups. They seemed so calm and were listening to their chaperones! Men, right?! Even at 11 years old they don’t listen. Forget to put #TweensTeensBeyond DOH!! Lol!! Oh my word, it IS all about the counting of heads and trying to make sure you keep them all alive, isn’t it? Stress!! Sadly, I will probably have to chaperone my youngest on this trip when she’s in 6th grade. Otherwise, I’m a horrible mom who prefers the oldest child, right? Wish me luck! Funny thing is that they had a waiting list for parents to chaperone this trip. Yes, there were so many of us who willingly wanted to ride a cramped motor coach FOREVER with hyper tweens. Well now I know to avoid it like the plague. I made the mistake of thinking it would be a nice thing to do. As I mentioned to Jo above, sadly, I’ll probably have to do it again with my youngest. Otherwise I’ve played favorites with my children, right?